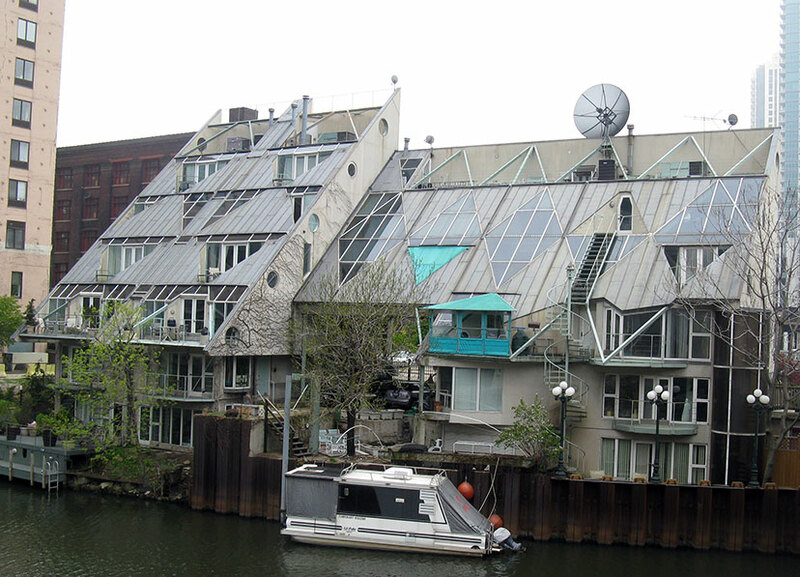 From the west, they look a bit forbidding, the cottages architect Harry Weese designed in 1988 along the west bank of the Chicago river, just south of the Kinzie Bridge. A long, monolithic concrete wall gives off an almost bunker-like vibe, until you notice that the windows that occasionally puncture it are a bit eccentric - portholes, triangular sashes, bays that look more like something you'd find on a shack than an upscale townhouse. Weese's nautical idioms came naturally, both from his wartime service in the Navy, and his love of sailing. 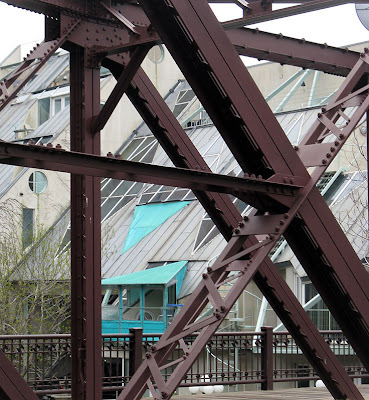 On her very fine blog, BLUEPRINT: Chicago, Caroline Nye writes that Weese's "inspiration for the cottages came from a trip he took down the Danube River in Hungary thirty years prior to their completion in 1988. There he had seen a collection of unique cottages where people were able to build whatever they wanted with minimal government interference." And, indeed, Weese's sly take seems to be an homage to what squatters might have put up if they only had the money - and imagination. The six levels of the four townhouses stack atop each other like cabins on a hillside, with a external stair that winds like a corkscrew up to a steep, ladder like series of steps leading to a glass, coffin-shaped door at the back of a terrace. 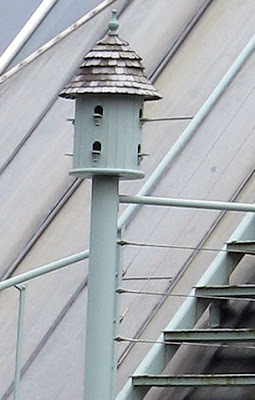 A birdhouse serves as a filial to the tall pole anchoring the stairway. The sharply-angled roof, expressed in a grid of rectangles and triangles, alternates between solid and glass for the skylights, and solid and voids for the terraces. Jut-angled brackets pop out of the facade. 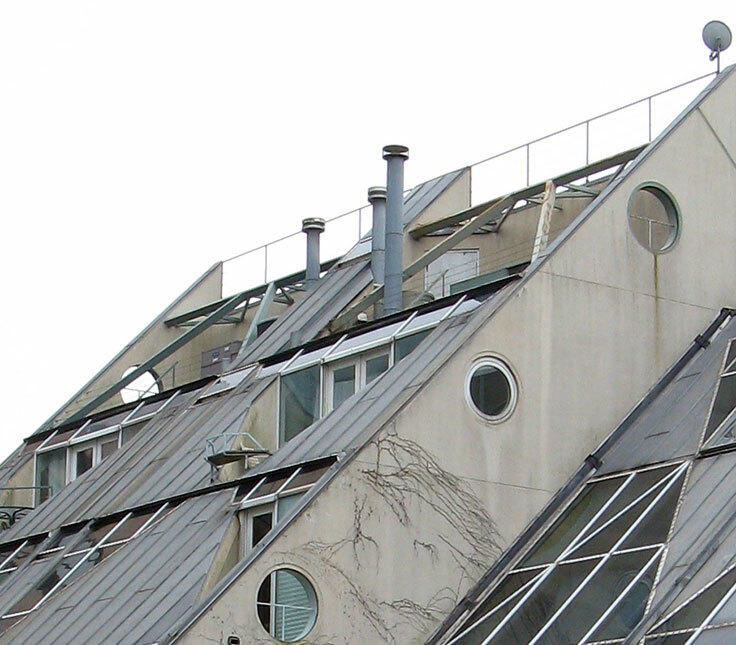 Pipe chimneys punctuate the roofline. This is probably one of the few buildings where satellite dishes seem perfectly at home in the overall design. The central courtyard seems less willed than improvised. To paraphrase FLW, the cottages look like they were built not on the riverbank, but of it. 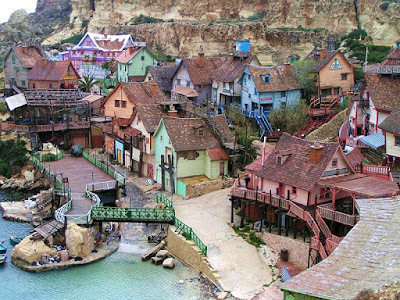 I keep thinking that the cottages would be right at home in Sweethaven, the huge set Wolf Kroeger constructed for Robert Altman's 1980 film Popeye, which remains a major tourist attraction on the island of Malta down to this very day. 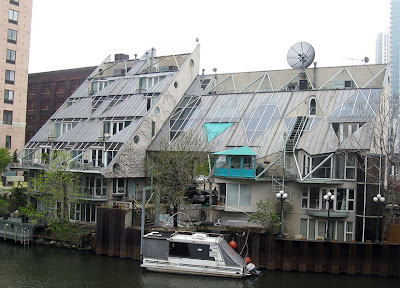 The cottages, similarly, are a one-of-a-kind, unsanitized delight, an anti-Miesian romp that rejects uniform repetition for a playful mosaic that, like a master juggler, keeps a boatload of variations in the air all at the same time. 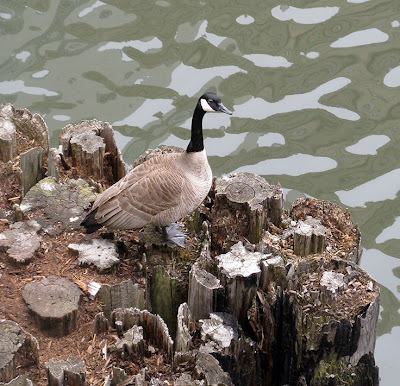 Yesterday, even this goose seemed to find serenity in contemplating Weese's cottages from his perch in the river. It's been over 20 years, so my memory's a bit hazy on these topics. I recall going through the units with Harry Weese. One of the units, I think, was Harry's, and he stored a boat there that could be winched down to the river. 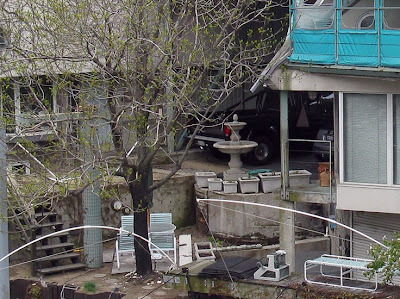 The northernmost unit was built, I'd heard, based on a defective survey and encroached onto city property. Weese had to buy an easement before he could sell the unit with clear title. 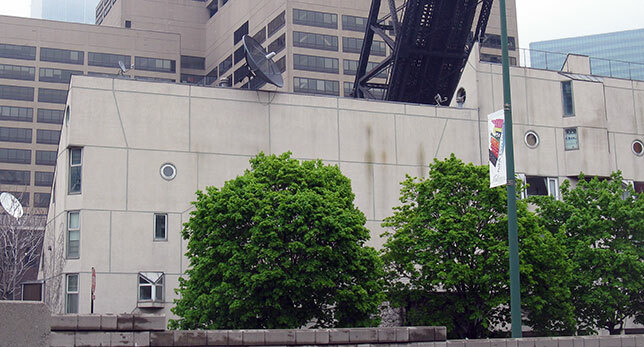 Am I the only one who sees echoes of the River Cottages in Lucien LaGrange's design for the high-rise at 510 W. Erie? I love these buildings...I used to look for them every time I took Metra by them in and out of Ogilvie. "WE have grown to love them?" Speak for yourself, LB. These brutalist structures are an urban blight. Let's see, an entire wedding party is ugly; one of Chicago's more charming structured should be burned down. I'm beginning to think if you don't like something, it must be good. dCome on, LB. You know that I am a fan of your work. I've supported your blog for 2-plus years. The article is great but the subject matter is horrible--lets be honest, it is a shanty town.
. . . and all the better for it. God spare us the sterility of still another corporate temple preening on the riverfront. Nice story Lynn. Lately I've been very much appreciating Harry Weese and Associates' Chinatown Square. It has aged well. They re-create the kind of quarters China has been recently tearing down at a furious pace. i love and have always loved and appreciated these residences. 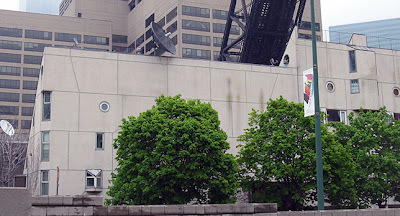 the chicago river is one of the most underutilized and under appreciated attributes of our city - one ride on the water taxi to work (cheaper than the bus) might change someones perspective. 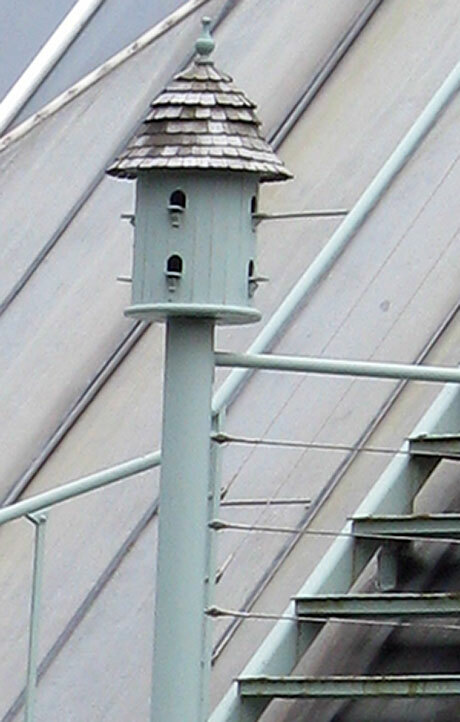 and thanks for pointing out the birdhouse, i like it even more now! Yeah, he says shanty town like it's a bad thing. Should This Building be Saved?